You know you’re allowed to like more than one sport, right? The latest round of “codewars” was started by an article in Saturday’s Sydney Morning Herald suggesting that Cricket administrators should be under pressure due to Soccer’s Asian Cup. This was responded to by a cricket publicist tweeting a series of facts about areas where the Big Bash League cricket is doing extremely well in comparison to the Asian Cup. After attending two Asian Cup matches last week, my third and final appearance at an Asian Cup game was on Friday at the Palestine v Jordan match. Now, you’re probably wondering what inspired me to come along to this match, right? Huge thanks to my girlfriend’s mate who arranged the tickets for us and four of Geri’s other netball teammates (yes, I was the only bloke in the group – and I’m sure people must have thought I was out of place)! On arrival at the ground we were ushered into an area where we were served drinks and some amazing food. When the game started we wandered out to our seats directly behind the Jordanian players’ bench. 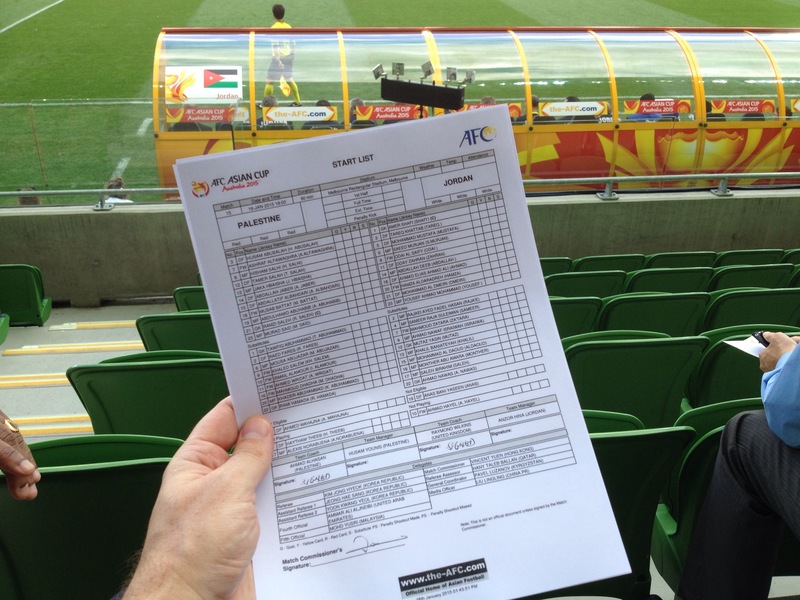 We were given a copy of the official team sheets. At half time we got more food and drinks. To suggest that we were spoilt is an understatement. It was a 5-1 win to Jordan so it’s difficult to argue this was one that will be remembered for the ages as a contest. 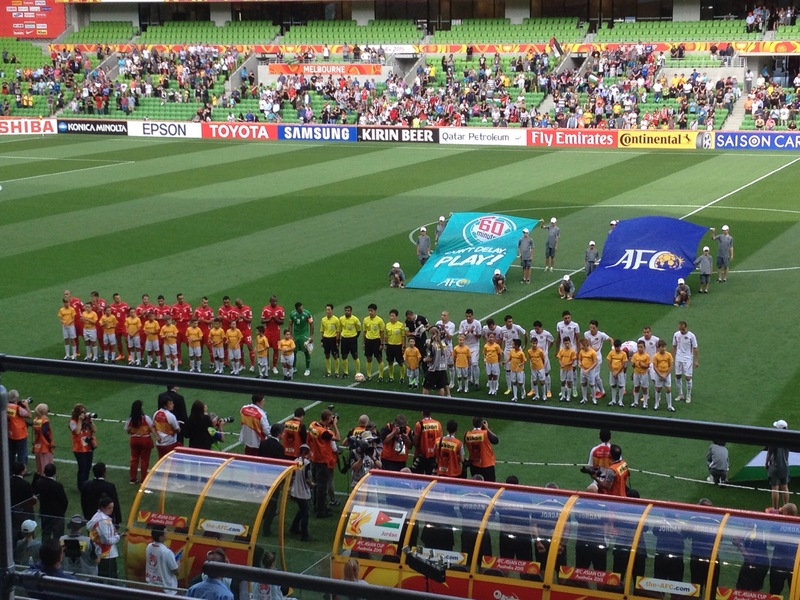 However, I still think there were so many positives about this game and the Asian Cup overall. Like most of the games in this tournament – there were plenty of goals and goal chances – so it was exciting even though Jordan were in control. There was a good crowd too – how does a game between two middle-eastern countries draw a crowd of 12,000 in Melbourne, Australia? There have been some great attendances throughout this tournament and the crowds (particularly the travelling fans and large expatriate communities) should be proud of their efforts. Obviously there are many political views about Palestine (well, I guess there are variations on two fairly strong views, when you think about it) but there was something special about seeing this team give their all out on the field even when they were outclassed. They had a hearty group of loyal fans cheering at the Swan St End, packing out the middle bay. There was a great moment when Palestine scored their first goal – and everyone, including the Jordanian fans, stood and applauded. Obviously they are political allies and had great respect for what they had achieved. As I hit “publish” on this week’s blog, Australia has sealed a Semi Final berth in the Asian Cup by beating China in Brisbane. At times during last night’s match it sounded like a Chinese home game. 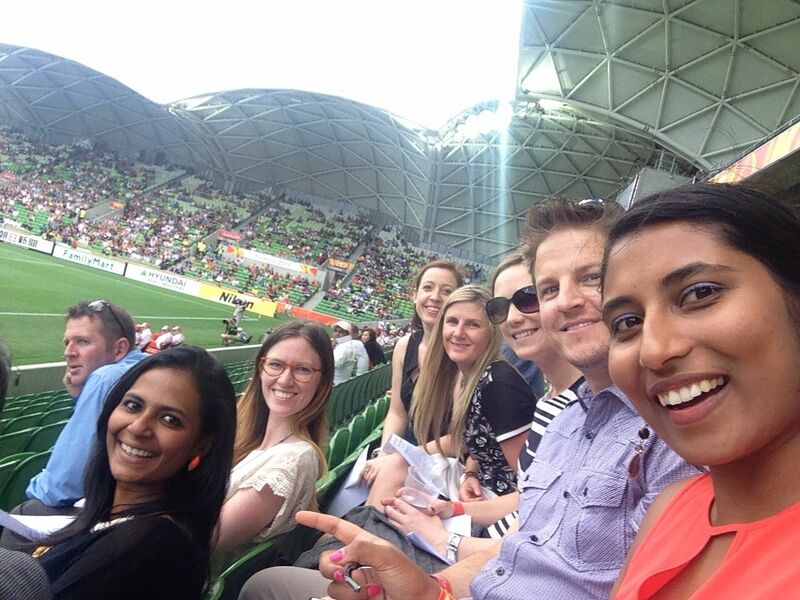 The tournament has captured minds to the point where a heap of people I follow on Twitter for their views on AFL were asking why the Semi Final wasn’t being played in Melbourne – suddenly people want to go to the game! It’s been a great tournament and I hope the people of Newcastle enjoy next week’s semi final. Cricket could be accused of having a codewar within itself, as Tests, ODIs and T20 all fight for prominence. Some T20 players and coaches have lamented the return of ODI cricket in the last couple of weeks, suggesting that there’s no need for it in light of the excellent crowds and ratings at the Big Bash. But each form of cricket draws a different crowd and each needs to be catered for. Sunday’s crowd at the MCG was a boisterous pro-India crowd. As with many recent MCG ODIs, the crowd is more heavily populated by fans of the visitors than the home side. India played a test match at the MCG not that long ago and there wasn’t anywhere near the number of Indian fans as the numbers present on Sunday. ODIs (in addition to being the most profitable form of the game) continue to be the most popular game for fans on the subcontinent – especially when it comes to selling TV rights. The India-South Africa game at the MCG in the World Cup is going to be a must-see if the crowd at Sunday’s game is any indication. There is definitely a place in the calendar for One Day Cricket – and the World Cup will hopefully prove this. Aside from being one of the colder nights I’ve ever spent at the MCG (The MCC did a roaring trade on hoodies that night!) it was also a very interesting game. Rohit Sharma was a class above. Unlike T20s where there’s no time to rebuild an innings that falters early, Sharma used the “middle overs” well, in partnership with Suresh Raina, to rebuild the innings to a point where he could hit out towards the end and get a total for India to defend. Each of his singles, let alone fours and sixes, were met with rapturous cheers. Aaron Finch played a belter for Australia, and the crowd was shattered when the local boy was unable to register his century, being dismissed for 96. Australia went on to win in a solid performance which bodes well for their World Cup prospects. An interesting little experiment took place at the end of the match as club cricketers bowled with a bink ball, so that the Channel 9 cameramen could test how their cameras picked up the pink ball. Is a Day/Night test even closer than we think? Now they say T20 is a young person’s game. As usual, the ground was full of families. Being school holidays, a late night on a Wednesday was not an issue for the youngsters. A crowd of 34,000 on a weeknight must surely be helping the coffers of those responsible for the sport. As I have an office job and an MCC membership, I often go to midweek T20 matches in the MCC Long Room, as I’m already meeting the higher dress standard in my suit and tie. The other added advantage is that not too many of the older MCC members who usually frequent the Long Room during footy season or test matches tend to come to T20s, so I usually get a good spot to stand with a great view of the game. Early on it was all Perth. Shaun Marsh showed that you don’t need to invent shots or slog to play a good T20 innings. With nothing but well timed and powerful cricket shots he got the Perth Scorchers off to a flying start. When he went out, Klinger took over, and they finished on a very good 2/179. With the Scorchers absolutely dominating, the biggest cheer of the night was for… a seagull! The early overs of the Stars innings were ordinary. Wright spooned a catch and Pietersen was out next ball. Handscomb was under instant pressure, surviving the hat-trick ball. He and white tried to pull the Stars back into contention. A mate who couldn’t make the game texted me asking “What’s the situation”? I replied “not good”. My girlfriend wondered whether it would be an early night. Another one of our friends noted she’s been to the first Stars game of the season (a loss) and now this one – maybe she was a curse? When more wickets fell – White, then Quiney, then Triffitt, it looked a lost cause. Handscomb was going well at over a run a ball, holding the innings together, but the required run rate was steadily increasing. Someone (I can’t remember who) commented “we need a few sixes in a row to get back into this”. Enter John Hastings. With 50 still needed off 24 balls, the Duke promptly hits three sixes off the first three balls of the 17th over. The lady at the back row of section N44, in the aisle seat, stands up to cheer. Why is this relevant? Because she looked as though she was at least 80, and nearly dropped her knitting in the excitement! We hadn’t noticed her until that point, but couldn’t help but be impressed. Out late at the cricket, cheering on a game that’s marketed to kids, pumping her fists with every six, while still working on what appeared to be a child’s dark blue cardigan. Hastings fell a few balls later, but the equation was now 30 off 18. When McKay was on strike at the end of the 18th over, we hoped he might make contact and get Handscomb back on strike. Nah, not needed, he hit two fours in a row and only 17 was needed off the last two overs. Arafat bowled a great 19th over, including a wicket on the last ball, leaving 12 needed off the last over. By this stage Handscomb was on 89, and had kept the strike, having stopped running when McKay skied the ball to avoid crossing with him. What happened next was phenomenal – he steps up to the first ball to turn it into a full toss and hit it for six. Then two off the next ball thanks to Boland sacrificing himself to get Handscomb back on strike – and Tye missing the ball and being unable to complete the runout. Then, on 97, Handscomb smashes the next ball for six to bring up the win as well as his century. Three different games, great crowds, great action. Why do we even need to have a discussion about whether one sport is better than another? Soccer and Cricket are both having fantastic summers. I’d prefer to focus on what sport is doing well. Getting women (old and young) and kids playing and watching, breaking down cultural barriers, and (hopefully) making money that will be reinvested back into the game. This entry was posted in Cricket, Soccer and tagged aami park, aaron finch, asian cup, australia, big bash league, cricket, cricket australia, India, john hastings, Jordan, MCG, mcgseagull, melbourne stars, ODI, palestine, perth scorchers, peter handscomb, rohit sharma, seagull, shaun marsh, soccer, t20. Bookmark the permalink.